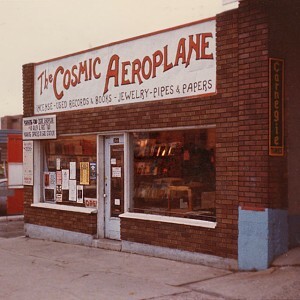 When Steve Jones and his partner, Sherm Clow, opened Cosmic Aeroplane in 1967 they brought Salt Lake its first adyad shop. “Salt Lake needed a place where you could get cigarette papers and things like the Berkeley Barb the L.A. Free Press and other underground newspapers,” Jones said. Steve moved to Salt Lake City from New York City in the 1950s when he was 13. Bit of a culture shock to say the least. Opening Cosmic helped him feel more at home and those seeking to tie into the growing counterculture movement found a home there as well. 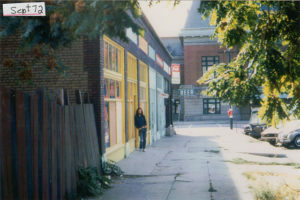 The first incarnation of Cosmic was on 817 E 9th South – 9th and 9th. The store was performing reasonably well, but when the landlord died and his sisters took over Jones and Clow received an eviction notice. The sisters were not thrilled with a recent obscenity case the store was involved in concerning a poster with a Kama Sutra theme among other things. They ultimately lost the case. It was time to find a new landing zone. They chose a space near the Union Pacific Train Station. It was a radical move in 1969 to locate on the crime-ridden west side. As Jones says, “No one knew the west side existed.” It was a great space with a storefront area and a garage space in the back that they converted to a performance venue. It was a bare bones operation with no stage, no curtain and folding chairs, but attracted some memorable acts. The Smoke Blues Band practiced and performed there. The Human Ensemble, which later became Salt Lake Acting Company, staged plays there. Juda Youngstrom directed the first two plays and went on to become the first artistic director. Some great artistic handbills were created for each production on 8 ½ X 11 paper. So many have been lost over the years. It was the start of a proud graphic history associated with the Human Ensemble. The floors, windows and ceiling were covered with Richard Taylor artwork. An in-store underground newspaper, the Electric News, started to circulate. But commercial success still proved elusive for Cosmic and so the owners moved again in 1974, this time to 366 South West Temple. It was a smaller space, but business immediately went up. After a couple of years Jones, with the encouragement of new partners Bruce Roberts and Ken Sanders, opened at Cosmic’s final stop on 258 E. 1st South.Bruce had talked to Steve for several years about opening a bigger places. When his parents died and he came into some money he offered to become a partner. 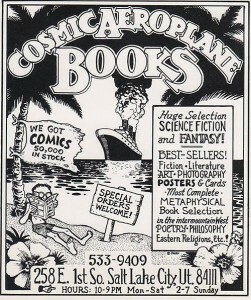 Ken Sanders was a part of Cosmic before going on to open his own book store, Ken Sanders Rare Books. Almost immediately they started printing Cosmic Aeroplane calendars with art work from local artists. The most iconic print features “The Cosmic Lady”. Artist Neil Passey did the original painting for a pyramid power religious group called Summum led by Claude R. Knowell also known as Corky Ra. Steve said that Knowell started the religion for two reasons. “He could write off his house and property on his taxes and he could make homemade wine for religious purposes,” Steve explained. After a falling out with Knowell, Passey gave the painting to Sanders. Passey modified it by giving the cosmic lady some hair and changing the pyramid in the background to a Greek temple. The Cosmic Lady was featured on their second calendar. They printed around 10,000 calendars each year. Some of the calendars featured original artwork, but they also had calendars with nature and historical photos. Eventually Steve moved on to other things and Ken was bought out in 1981, leaving Bruce to run it alone until it finally closed down in 1991. “It was the sort of thing that wouldn’t last forever, but it was great while it worked,” Steve said.